The more budget orientated SSD arrives, but is 40GB too small? We've been having such problems with solid state drives, haven't we? First it was fresh, fast and exciting, then Intel's initially exciting drives started nose-diving in speed. Price was a problem, but the performance issues were more of a concern. 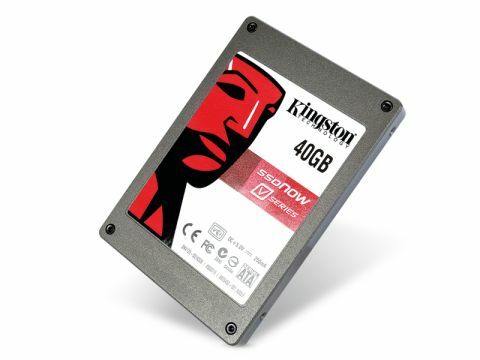 Kingston's Intel-based, cheapo 40GB SSDNOW V Series SSD certainly has addressed the cost concerns, but what of performance? Initially we were aghast at the price of the first SSDs, but for the early performance figures we were more understanding; when they started failing wholesale however it rather turned us off. Later SSDs have fixed these issues and Intel's latest, the X18-M was a bit of a beauty. Manufacturers like OCZ and Samsung have come into the market and hit the ground running too. Still though we're experiencing performance problems, with drive stuttering being our biggest gripe. These are all down to controller and firmware issues, as we've spoken about in depth in our previous testing, but with the release of Windows 7 and its in-built TRIM command this is looking less and less of a problem. Indeed this 40GB Kingston drive displayed no discernable stuttering at all and the OCZ Agility has had a firmware/Win7 update which has eliminated its stuttering issues too. So things are now looking good in performance terms then, but what of cost? Well, Kingston has cut down Intel's latest memory controller for its low-capacity 40GB drive, providing a low-cost drive with serious performance. At under a ton it's positively bargainous for an SSD, but the capacity may still seem a little tight. If you're just planning to house your OS and a few important apps though, it actually works out; after all people have been using low-cap Raptors as boot drives for years. The performance in terms of peak read and write times may not be quite on a par with drives like OCZ's Vertex and Samsung's biggy – especially in the sequential write speeds – but if you look at the more real-world benchmark of 4K 64-thread random writes, the sort of small disk accessing that occurs almost constantly in modern systems, the results are impressive. At 18.1MB/s it's almost twice as quick as the Vertex and beats it by a few seconds in game loads too. The cut-down Intel controller really makes its presence felt and if you felt like setting up a couple in RAID 0 the performance figures go through the roof. When you consider the 120GB Vertex is almost £300, and the slower Agility over £200, spending the money and setting two Kingston drives up as your 80GB boot drive is a bit of a winner. At £160 an 80GB striped array is now my config of choice for SSD joy. Kingston coming out of nowhere to grab the SSD crown, who saw that coming?